A superb attractor method to induce any carp into a feeding Response, as the pellets slowly dissolve, releasing high levels of taste and attractors into the direct area in and around your Hookbait. The Response Pellets are designed to be used in conjunction with boilies to create the ideal feeding situation. All the pellets make an excellent method mix. First scald pellets of your chosen flavour for approx 10 mins and then drain off all excess water being careful not to burn yourself. When the pellets have cooled you can add (optional) 15ml of your chosen additive per kilo of pellets and mix thoroughly and than leave to soak for approx 2 hours. You should find your mix is now ready for use. If your mix is a little wet you can add a small amount of base mix to it to dry it out. 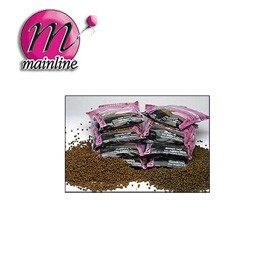 Also as a further enchantment to method mix you add any of our flavours stimulants and oils from our range .